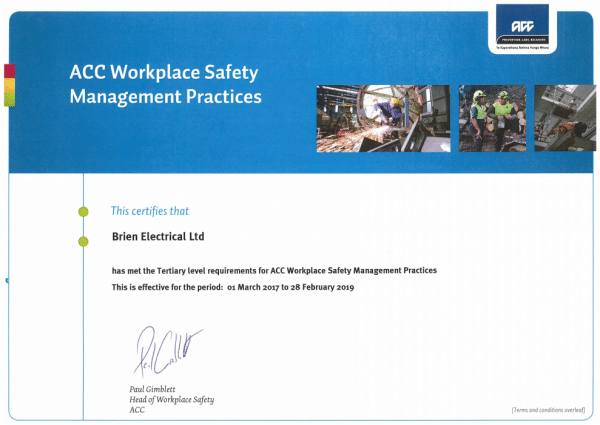 Brien Electrical have continually improved our Health & Safety Management Processes as national policy has changed and Safety in the Workplace has become more important in business. The Health & Safety of our personnel & of our customers is our daily paramount consideration. We have recently attained Tertiary Level requirements in ACC’s Workplace Safety Management Practices programme, Certificate below. This Health and Safety Statement of Intent, in accordance with the Health and Safety at Work Act 2015 (HSWA) outlines the policy of Brien Electrical Ltd as to the management of health and safety at work. The management of Brien Electrical are committed to ensuring that health and safety will be integral to, and equal with any other business function. This enables us to meet our objective of managing and conducting our work activities in such a way as to ensure, so far as is reasonably practicable, the safety, health and welfare at work of our workers and others who may be affected by our business activities. In demonstrating management’s duty of care, we will take all practical steps to provide a working environment that minimises incidents of risk or personal injury, ill health or damage to property. Brien Electrical takes a whole of business approach to health and safety, including worker attitudes and workplace culture. Striving to reduce the number of work related injuries due to incidents that occur during work activities. Regularly reviewing (at least annually) health and safety policy to ascertain compliance to relevant legislation, regulations, guidelines, codes of practice and safe operating procedures. Including and promoting health and safety practices throughout all areas of work and regularly monitoring and reviewing systems for continual improvement purposes. Encouraging worker participation and consulting on all matters relating to health and safety in the workplace. Motivating all those involved with our work to contribute to an improved health and safety performance. Maintaining a zero tolerance to Drugs and Alcohol during work hours and providing a system to identify and deal with potential safety issues due to drug and alcohol use. Providing well maintained plant and equipment. Providing ongoing training at all levels to ensure all workers can work in a safe and professional manner always. Actively encouraging the early reporting of any pain or discomfort. Focusing on accurate time reporting and recording of all accidents, incidents and unsafe conditions. Investigating reported accidents, incidents and unsafe conditions and taking corrective action. Supporting workers who have experienced work and non-work related injuries in their safe and early return to work, seeking specialist advice where necessary. Reviewing management positions against designated responsibility performance. Involvement in the workplace health and safety system. Adhering to correct procedures and equipment usage. Early reporting of any pain and discomfort. Helping new workers, trainees and visitors to the workplace understand the correct safety procedures and why they exist. Informing the Managing Director immediately of any health and safety hazards or safety concerns. Making sure no action or inaction causes harm to themselves and others. Keeping the workplace tidy to minimise the risks of accidents. On an at least annual basis. As required in line with legislative changes. As required in response to any changes identified during toolbox meetings or arising from accidents, incidents, or new hazards.